Regular readers know that I love the Scandinavian look. I love the minimalism and the soft, neutral colours paired with natural, warm textures. In my own home, I love a bit of colour too, but still want to steal some of the ideas from this style. 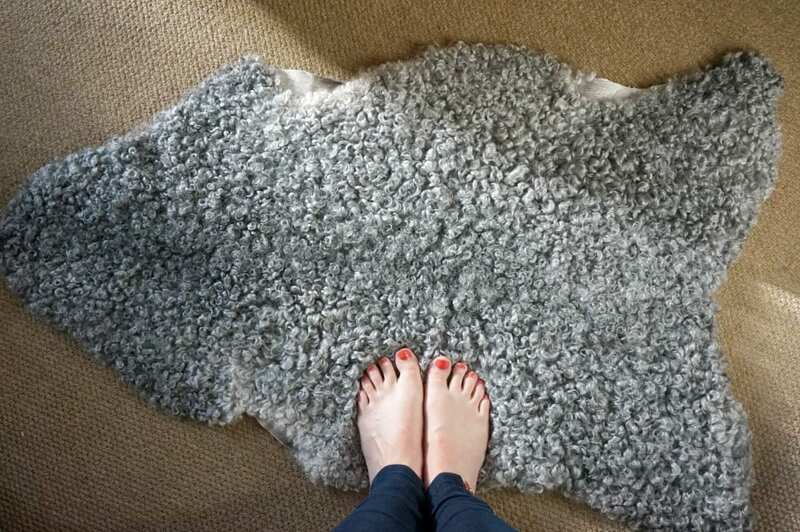 In particular, I’ve fallen in love with sheepskin rugs. They remind me of my childhood, when we had sheepskins in all the bedrooms, and I think they really bring a little luxury into the home. 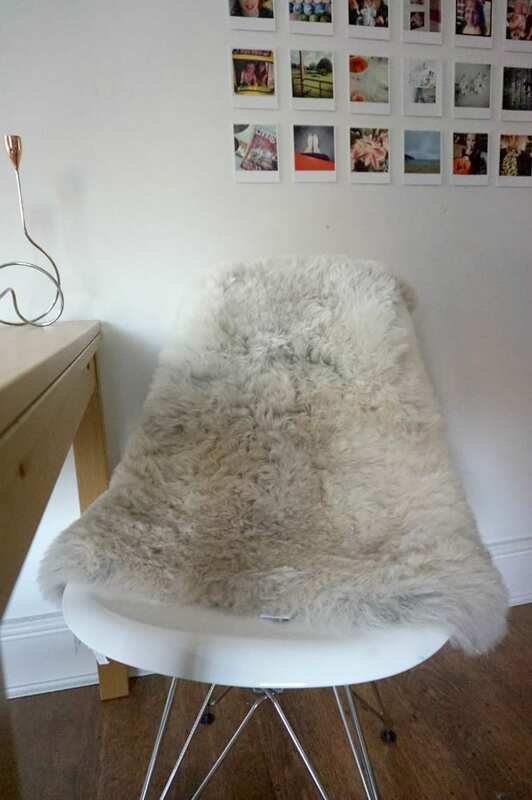 These days, we tend to use sheepskins in different ways, and with my attic conversion coming along nicely, I’ve been thinking about putting some on the wooden floor in the bedroom. 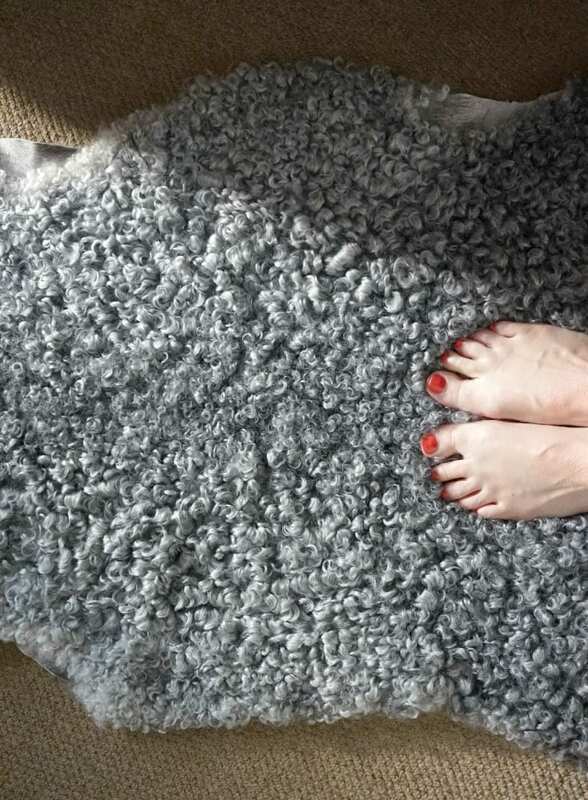 After chatting to the lovely team at Sheep Shop, I’m trying some Swedish and Icelandic rugs or pelts and have been experimenting with using them all over the house too. Sheep Shop is a Swedish brand, branching out into the UK. They sell sheepskins, cushions and wool throws made from sustainable and organic products, offering beautiful quality and value for money. They source their sheepskin from small local farms, a bi-product of the meat industry, where they would only be wasted. They are too beautiful for that to happen. So, how about 3 different ways to use a sheepskin rug in your home? It’s the most obvious isn’t it? They look great either on wood, stone or carpet and are the perfect accessory for when you first step out of bed in the morning. 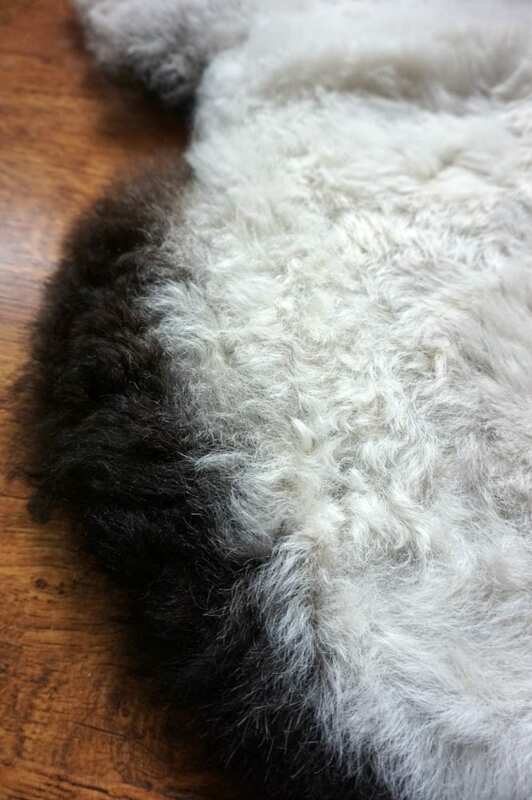 This rug is the Swedish Gotland sheepskin pelt renowned for their shiny, curly hair. I’ve never seen a sheepskin rug like this, it’s remarkable. At birth, this breed of sheep is usually black, but then the wool turns a lighter grey as they get older. Some have a darker line through the spine, although as their all unique and individual, mine doesn’t have this. You’ll have to take my word for how soft this feels; I just want to keep touching it. It’s become very popular over the last few years to use sheepskin pelts and rugs in lots of different ways. Putting them on dining chairs and benches is a great way to both keep warm in the winter months, and to decorate and adorn your dining area. This rug is an Icelandic Organic Brown Belly sheepskin with a thick fleece that varies in colour, but usually has a darker edge, often brown sometimes black. Again, it’s incredibly soft, feels very luxurious and is a very deep pile as you can see below. The colours are vibrant, and the fleece feels wonderfully soft. Beautiful to both sit and stand on. Of course, you can use the sheepskins on your armchairs as well as your dining chairs, and they look just as stunning. 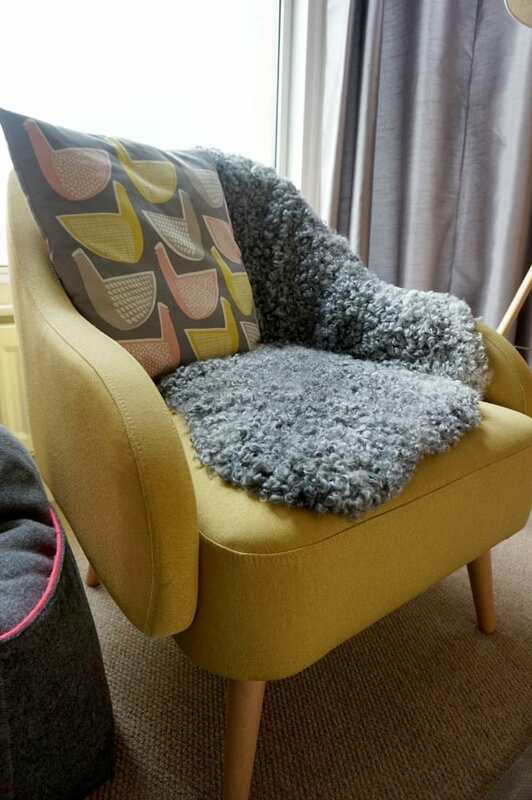 I love the way the Gotland grey wool contrasts with my yellow armchair and offers extra comfort as well as protects the fabric. I’d beware if you have pets, the cats will take up residence! 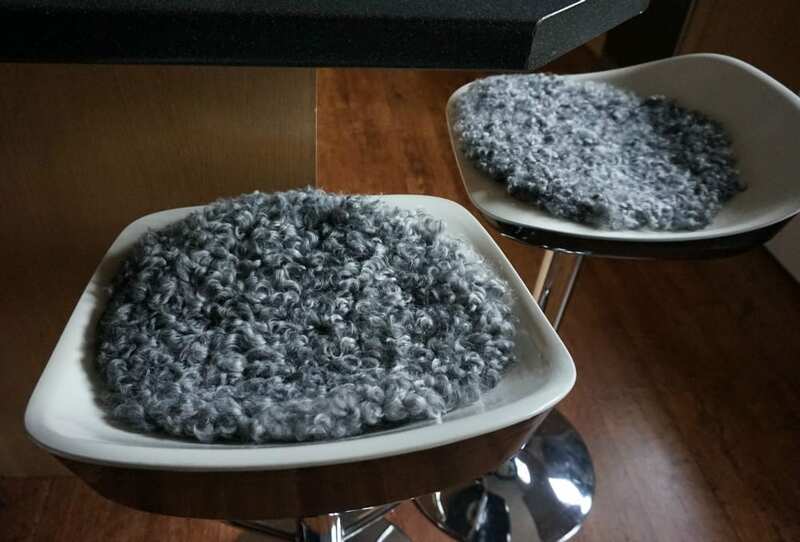 Finally, check out these Gotland sheepskin seat covers on my breakfast bar stools. These are the perfect size for most seats – 33 cms in diameter and can be machine washed. How practical. My children adore these and say they make the seats much more comfortable. They don’t slip around either, which I did think they might. Combine these with the larger Gotland sheepskin and you have some gorgeous, stylish home accessories. 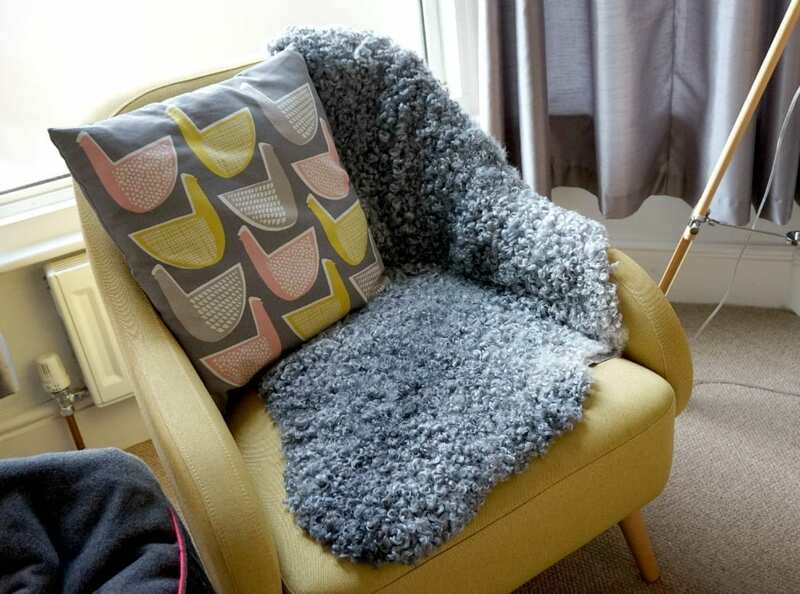 All of these products are available at the Sheep Shop, with prices from £29 for a seat cover, to £99 for an Icelandic rug, and then from £169 for the grey Gotland sheepskin rug. I would highly recommend them for quality and value. Look after them properly and they will last decades. Do you have any sheepskin rugs in your home? Do you use them in places other than the floor? Disclosure: The rugs were gifted but all opinions and comments are genuine and honest. Love the styling Jen! I have never seen anything like the Swedish Gotland sheepskin pelt before, I absolutely love the curly nature of the hair. Gorgeous! I’ve been thinking of getting a sheepskin rug for a while now like that they source them from meat industry and save them from wastage.